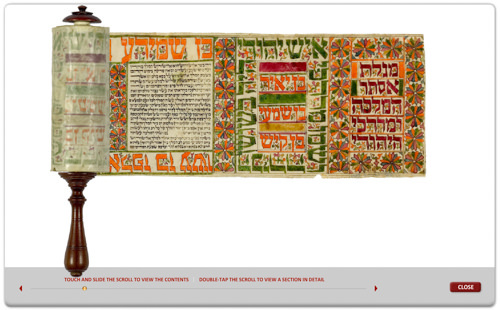 This megillah, which opens with two brightly colored prefatory panels, is further embellished with a band of enlarged ornamental text comprising the genealogies of Mordecai and Haman that frame the entire scroll. This scheme of decoration is characteristic of megillot produced in Iraq during the nineteenth century. 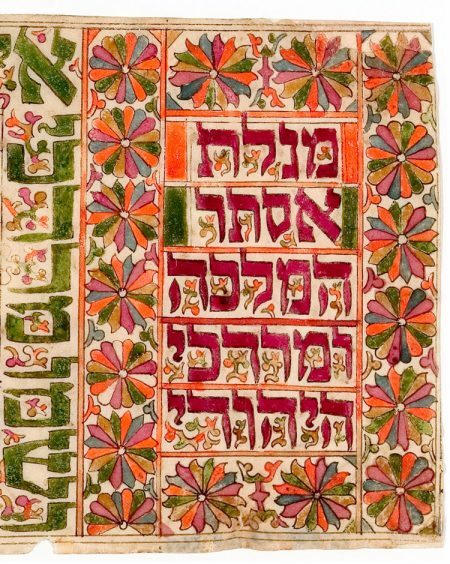 Whereas many classical interpretations of the Purim story celebrate of the primacy of Esther’s role as the savior of the Jewish people, the decorative text on this megillah emphasizes the importance and centrality of Mordecai to the Purim narrative. While most Esther scrolls are devoid of a title, when one is present it simply states Megillat Ester. In contrast, the initial panel here bears an expanded title, Megillat Ester ha-Malkah u-Mordekhai ha-Yehudi (The Scroll of Esther the Queen and Mordecai the Jew), penned in large purple letters and surrounded by a frame of multihued rosettes. a quotation from the text (Esther 2:5): Ish Yehudi hayah be-Shushan ha-Birah u-Shemo Mordekhai ben Yair ben Shimi ben Kish (In the fortress Shushan lived a Jew by the name of Mordecai, son of Jair son of Shimei son of Kish). The ancestry of Mordecai continues and is greatly expanded upon in the monumental orange text that runs along the entire length of the scroll. In the upper and lower borders, the scribe penned the genealogy of Mordecai, going back some thirty-three generations to the patriarch Abraham. This enumeration is followed by a briefer and less distinguished lineage for Haman. The elaborate genealogies of Mordecai and Haman that appear in the Braginsky Collection megillah are not part of the biblical text of Esther. Rather, they are taken from the Targum Rishon, an Aramaic translation the origins of which date to the seventh century and which incorporates elements of midrash. In this translation the respective lineages of Mordecai and Haman are presented in order to establish the righteousness of the Jewish people and the wicked- ness of their oppressors, as well as to emphasize that the salvation of the Jewish people was dependent on the merit of their righteous ancestors. Benjamin 1987, pp. 278–279, no. 191; Grossfeld 1983, pp. 22, 28–29, 144; Shachar 1981, no. 417.